Strike with power and hold with safety! 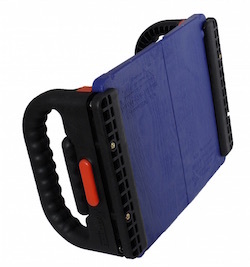 The New BolderX holds boards securely and keeps fingers protected safely away from the impact zone. Kick or strike with confidence to improve accuracy, speed, and power. Two grips clamp your boards in place using rubber compression strips and spacer inserts to reduce slippage. The MA Toolz BolderX is adjustable and designed to hold one or two UMAB rebreakable boards, and others, too. Comes with carrying bag. BOARD(S) NOT INCLUDED.